American Eagle 1 oz Gold Coins are the most popular modern gold coins minted today. Gold Eagle Coins were authorized by the US Congress via the Bullion Coin Act of 1985, and first minted by the United States Mint in 1986. American Gold Eagle Coins quickly became an American classic. Like the Canadian Gold Maple Leaf Coin, the American Gold Eagle Coin is a top gold choice for gold bullion investors and gold coin collectors around the world. The American eagle 1 oz gold coin continues to be one of the best gold coins to buy for this reason. If you decide to buy gold coins online, your choice of the Gold American Eagle Coin ensures your gold coins will be recognized by gold bullion dealers around the world. The Gold American Eagle Coin is also eligible to be held as part of your retirement savings, and can be part of your gold IRA investment strategy. A single gold coin like the 1 oz gold American eagle is a wonderful gift for a grandchild, or for a young coin collector. Gold bullion coins can be a great gift for a wedding too. Help the newlyweds start their life together with a perfect present that will have everlasting value. Make this gold coin a special present by adding a wooden Volterra gift box. Other sizes of Gold Eagle Coins are also available for a gift to fit all budgets. 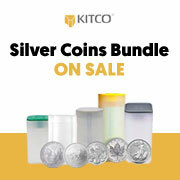 Why buy Gold Eagle Coins from Kitco ?